Under the body of the V-12 infused with metal from the Indian Navyai??i? ?s decommissioned Vikrant aircraft carrier is a 124.5 cc air-cooled, single-cylinder SOHC mill employing two spark plugs nestled in a double cradle tubular frame. Bajajai??i? ?s DTS-i twin spark plug setup squeezes out 10.7 PS and 11 Nm from the long stroke engine and thereai??i? ?s where that entire grunt comes from. Peaking at 5,500 rpm, this engineai??i? ?s torque curve and gear ratios is what make all the difference. Open stretches bring out a rather enjoyable side to the V-12. But even in traffic, cycling up the lower gears is effortless, while the need to downshift from third and higher is minimal ai??i?? making it nearly as convenient as a scooter. The light clutch helps while the conventional ai???all-upai??i?? shift pattern on the heel-and-toe lever slots in with confidence.The ergonomic triangle made by the handlebar, hip and pegs is comfortable too ai??i?? aided by the slight back support from the removable rear cowl. The width of the handlebar makes it easy to turn in and out of traffic. However, the ends feel raked in more than necessary. 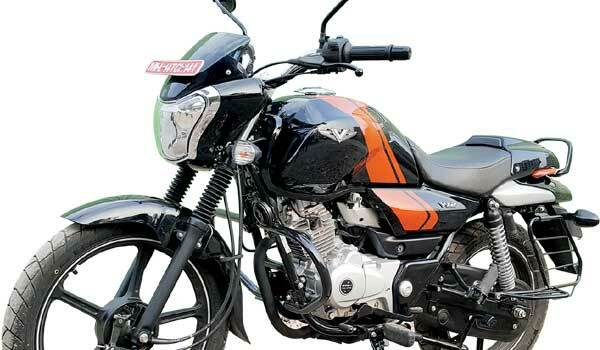 Suspension duties at the front are courtesy 30 mm telescopic forks while the rear is handled by gas charged twin shocks. The tyres retain the 18-16-inch front-rear rim diameter from the V-15, but the rubber itself is skinnier but fatter than other 125 cc rivals ai??i?? 2.75 on the front and 100/90 at the rear. The front brake, however, has gone down from the 240 mm disc on the V-15 to a 130 mm drum on the V-12. Considering the smaller sibling will not be attaining massive speeds, the small drum is adequate for riders who plan their braking well. 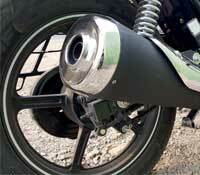 to the swooping rear fender complement the chrome-surround tail lamp. And the rather thick exhaust can isnai??i? ?t just for cosmetic effect but also for its unique throaty note. In a world full of robotic and unemotional 100 and 125 cc commuters, the V-12 is a breath of fresh air ai??i?? feeding a need for performance, grunt and machismo ai??i?? things that make a two-wheeler, a motorcycle.